Here we go again. The latest SawStop Vs Bosch Reaxx lawsuit has found in favor of SawStop with the ruling coming from Administrative Law Judge Thomas B. Pender. As it has been since the Reaxx was first announced, the lawsuit is based on patent infringement. Editor’s Note: This story contains all the information we’ve received as it has become available and reported by Pro Tool Reviews. Read from the beginning to follow the story in its entirety or scroll to the bottom to see the latest updates. There are significant difference in the way the two companies handle table saw safety. The Bosch Reaxx uses an airbag style cartridge to punch the blade below the table surface. This occurs once conductance (flesh) is detected. The blade is able to keep spinning on its way down and doesn’t damage it. You can see the results of our testing on a top strike and front strike where I put my hand in the blade on our YouTube channel. 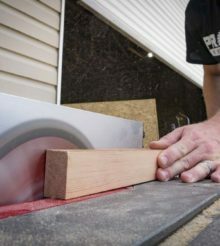 SawStop uses a different mechanism to drop the blade, but also employs an aluminum brake. In our testing on both top and front strikes, the blade stopped with less damage to my hand than Bosch’s Reaxx. Despite the obvious differences in application and results between the two saws, Judge Pender believes that there are similarities underneath the surface that are indicative of an infringement. As you’d expect, Dr. Stephen Gass is pleased with the outcome. He had this to say following the ruling. “Although Bosch does not normally discuss details of litigation because we feel it is best handled in the context of the legal proceedings, we have seen statements about litigation concerning the Bosch REAXX™ Jobsite Table Saw that give a misleading impression of what has occurred. At this time legal proceedings are still under way. The International Trade Commission (ITC) will review the initial determination provided by the Administrative Law Judge on Sept. 9, 2016, as well as additional arguments from the parties, before it makes any decision in the matter. The commission’s decision is not expected until early January 2017. Contrary to any other implication, the patent legal proceedings are ongoing and not final. The Bosch REAXX Jobsite Table Saw is based on patented technology developed by the Power Tool Institute and the engineering team at Robert Bosch Tool Corp. in Mount Prospect, Ill. We believe that advanced REAXX safety technology does not violate any competitor’s intellectual property rights. It is disappointing that a competitor is continuing its campaign to stop the sale of patented REAXX technology to consumers. The patents asserted against REAXX are based on applications filed more than 15 years ago; Bosch does not believe they apply to REAXX technology. In addition, Bosch believes that if the U.S. Patent and Trademark Office had complete information it would not have issued certain patents in the first place. In this particular SawStop Vs Bosch Reaxx lawsuit, the victory could have serious consequences for Reaxx owners. Not only is SawStop looking to block the import and sale of the Reaxx, but also the sale of the cartridges. That would mean Reaxx owners would be unable to replace cartridges. This is a component required for use. Certainly Bosch will work hard to ensure that doesn’t happen, but it will ultimately be up to the courts or a settlement between the two to decide. So is the Bosch team a bunch of bad guys hiding in secret, reverse engineering a SawStop table saw to develop the Reaxx? Not likely. The physics involved in detecting electrical conductance on the blade are fairly straightforward. While there are numerous ways to design a system that can detect a flesh strike, electrical conductance is one of the easiest. Since the shortest distance between two points is a straight line, you can bet that Bosch’s engineering took a similar path that SawStop did when it first developed the technology. While that’s a natural process, it’s also why our inventions can be protected under U.S. patent laws. It’s not necessary that someone copy what we produce (although that does happen), but if their processes result in too many similarities, it’s an infringement. We can bet that this isn’t going to be the last SawStop Vs Bosch Reaxx lawsuit, so we’ll keep our eyes open for more news as it comes out. The latest SawStop Vs Bosch Reaxx ruling has fallen in favor of SawStop. The end game is stop the import and sale of Reaxx saws and parts. More litigation will have to take place before making any firm conclusions. The results will determine the future of Bosch’s safety table saw. For more details on SawStop Vs Bosch Reaxx, Clint DeBoer and I break them down in a video following our testing of both saws. The U.S. International Trade Commission (ITC) issued a limited exclusion order against Robert Bosch Tool Corporation and Robert Bosch GmbH. This more or less prevents them from selling either the Reaxx saw or parts for the Reaxx saw in the United States. Further, they issued a cease and desist order against Robert Bosch Tool Corporation. They’ve also terminated (closed) the investigation with respect to the ’836 and ’450 patents. SawStop’s withdrew their allegations on those patents. But two patent violations remain, and that’s enough for the ITC to issue a final decision essentially barring Reaxx (the saw, parts, and cartridges) from the U.S. under s cease and desist order. The Commission has determined that the appropriate remedy is a limited exclusion order prohibiting the entry of table saws incorporating active injury mitigation technology and components thereof that infringe claims 8 and 12 of the ’927 patent and claims 1, 6, 16, and 17 of the ’279 patent, and an order that Robert Bosch Tool Corp. cease and desist from importing, selling, marketing, advertising, distributing, offering for sale, transferring (except for exportation), or soliciting U.S. agents or distributors of 2 imported table saws incorporating active injury mitigation technology and components thereof that infringe claims 8 and 12 of U.S. Patent the ’927 patent and claims 1, 6, 16, and 17 of the ’279 patent. The Commission has determined that the public interest factors enumerated in section 337(d) and (f), 19 U.S.C. § 1337(d) and (f), do not preclude the issuance of the limited exclusion order or cease and desist order. The Commission has determined that bonding at zero percent of entered value is required during the period of Presidential review, 19 U.S.C. § 1337(j). Commissioner Kieff dissents as to the bond determination, and writes separately to explain his views both concerning the basis for issuing the cease and desist order and for making the bond determination. The investigation is terminated. Updated: 2/07/2017 – It’s Not Over Yet! More information has come available in the SawStop Vs Bosch Reaxx lawsuit offering Bosch fans and owners some hope. First – and this is a critical point – the ruling has entered a 60-day review period. During this time, nothing changes with the sale, delivery, and repair of the Reaxx. Lawyers on both sides will have the opportunity to digest the results and pursue a way forward before the ruling goes into effect. Second, Reaxx owners can breathe a sigh of relief. The ruling does not affect the ability for Bosch to manufacture and sell the activation cartridges in the US. This is another major point of emphasis as Bosch owners may still be able to maintain the safety status of their saws even after their current cartridges are spent. While the ruling does state that Bosch cannot Bosch can’t sell parts for the Reaxx, note that it’s specific to two patents – namely ones that involve the detection system. That means all the other parts that make the saw work can still be produced and sold. It’s not as if the failure of a single gear means your saw is now shot. “Robert Bosch Tool Corp. is disappointed with the ITC’s decision. We are now in the 60-day presidential review period, in which we hope the president will review the facts of the case and then veto this exclusion order. Bosch maintains that development of its professional table saw product respects other companies’ patents and represents a new and unique technology in the construction market. It is disappointing that a competitor is continuing its campaign to stop the sale of REAXX technology to consumers. We believe that advanced REAXX safety technology does not violate any competitor’s intellectual property rights. The patents asserted against REAXX are based on applications filed more than 15 years ago; Bosch does not believe they apply to REAXX technology. In addition, Bosch believes that if the U.S. Patent and Trademark Office had complete information, it would not have issued certain patents in the first place. It is our firm belief that the development, marketing and distribution of the REAXX Jobsite Table Saw is completely separate and distinct from anything other brands or manufacturers are doing. “Bosch maintains that development of its professional table saw product respects other companies’ patents and represents a new and unique technology in the construction market. However, based on the current legal proceedings at the U.S. International Trade Commission (ITC), Robert Bosch Tool Corporation will be required to stop sales of the REAXX Table Saw on March 27, 2017, unless the ITC ruling is overturned. This sales hold will be in place until Bosch can clarify next steps through the ITC appeal process. Distributors who have previously purchased REAXX table saws from Bosch are not impacted by the ITC order and can continue to market and sell REAXX table saws to end users. Bosch will continue to provide distributors and end users with service/repair and support for REAXX table saws previously purchased, including the availability of replacement cartridges manufactured in the U.S., which are not subject to the ITC import ban. We will continue to fight for our ability to sell REAXX in the future by appealing to the U.S. Court of Appeals for the Federal Circuit. I saw the REAXX saws for sale this past weekend at a Rona store in BC. Are the problems twixt the two solved? Have they reached a settlement? Re your test of the Bosch with a board to limit injury. I appreciate your sacrifice for science but I think the board affects the results. The saw triggerred OK but how much further might your hand have gone without the board? I am not suggesting you try it but the hotdog is perfectly valid. Jam the hotdog into the blade fast, to simulate a slip and see how deep it goes. The losers are consumers who can’t afford to pay $1,300 for the cheapest table saw that Saw-Stop sells and consequently risk losing fingers. Saw-Stop ought to lower the license cost for home saws. I’m all in favor of rewarding inventors, but I think that their greed is keeping the yearly toll of 4,000 fingers per year that could be somewhat avoided. I’m guessing most of those fingers belong to home users.